Seattle Center Monorail provides transportation between downtown Seattle to Seattle Center. 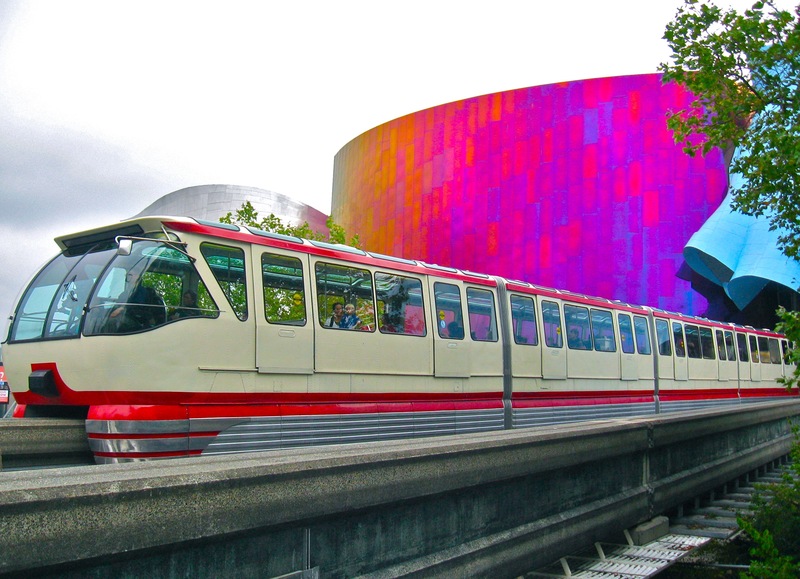 It is fast and directly travels from Westlake Center (5th Ave. and Pine Street) to Seattle Center (adjacent to Space Needle and Experience Music Project). The Monorail was built for the 1962 Seattle World’s Fair and celebrates it’s 50th birthday on March 24, 2012! More information about the Monorail’s history can be found HERE. Saturday & Sunday 8:30am – 11:00pm. Purchase tickets at the Monorail Ticket Booth on either Monorail platform. Cash only. Monthly passes can be purchased directly from the cashier inside the Monorail Ticket Booth at either platform – CASH ONLY. Monthly passes can also be purchased on our website: http://www.seattlemonorail.com/sales by credit card. Passes purchased online will be mailed to the address you specify. Pass gives LCI Attendee with unlimited rides on the Monorail from July 3-9. Offer expires June 22, 2011. Passes are only being sold online. Pass is non-transferable. Traveling from Sea-Tac Airport? Take the Sound Transit Link Light Rail from Sea-Tac to Westlake Center. Go up to the third floor of Westlake Center and catch the Monorail to Seattle Center! This entry was posted on June 16, 2011 by Megan Ching. It was filed under Information, Photos, Upcoming Events and was tagged with Attractions, commute, Connecting, Convention, EMP, Experience Music Project, getting around seattle, History, Hours of Operation, July 3-9, July 4-8, LCI Convention, light rail, link light rail, Lions Clubs International, Monorail, Monorail Group Tickets, Monorail Monthly Pass, Monorail School Group, Monorail Ticket Prices, Monorail Ticket Rates, One Week Pass, Premier Attractions, Sea-Tac Airport Transportation, Seattle Center, Seattle Monorail, Seattle's Convention and Visitors Bureau, Sightseeing, sound transit, Space Needle, transportation, Travel, Traveling, Visit Seattle, Westlake Center, what to do in Seattle, Where to go in Seattle.